it lately. In our prepared foods case there's a tub of applesauce that every time I get any of the foods around it, I smell applesauce. 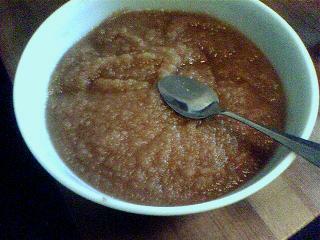 So I went and bought 4 pounds of apples (about 8 of them, Galas) and made applesauce yesterday. I've never made applesauce. How come no one told me it was so easy? whatever spices you want - I used a ton of cinnamon (2 teaspoons?) and some nutmeg. Put everything into a pot. Heat until the liquid is boiling, covered, then lower heat to med-low and cook about 30 minutes, stirring occasionally. Sauce is done when apples break easily when you press into them with a wooden spoon. Put everything into the food processor, apples and liquids. If it doesn't all fit in one batch, do two. Or three. Pour into a bowl, taste, then eat as much as you can. 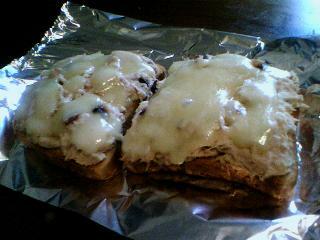 I've been making tuna melts with Ener-G brand brown rice bread. It's not the best, and even better are Wholefoods GF bagels, but I don't have any money to buy them right now. Make sure the bread is toasted really well before adding the tuna for a tuna melt or the bread gets weird and soggy. Also in my diet lately (poor people's diet) are bowls of rice noddles with powdered soup mix, from the Asian grocery store. I ate maple yogurt for lunch and it gave me a wicked stomachache. I can eat tons of cheese, drink glasses of milk (whole), and it doesn't bother me, but yogurt and ice cream make my stomach hurt. Someone please send me a large box of maple sugar candy and some maple syrup from New England, and gluten-free baked goods from Europe. Also some more of those Nestle fruit pastilles I got from the Asian grocery store the other day. Sunday my dad is getting married. I'll let you know how that goes. My stomach is making the most horrible noises.